There is nothing quite like the exhilaration of skiing down a beautiful mountain slope. Especially when you add in a top-notch resort to come back to at the end of the day. 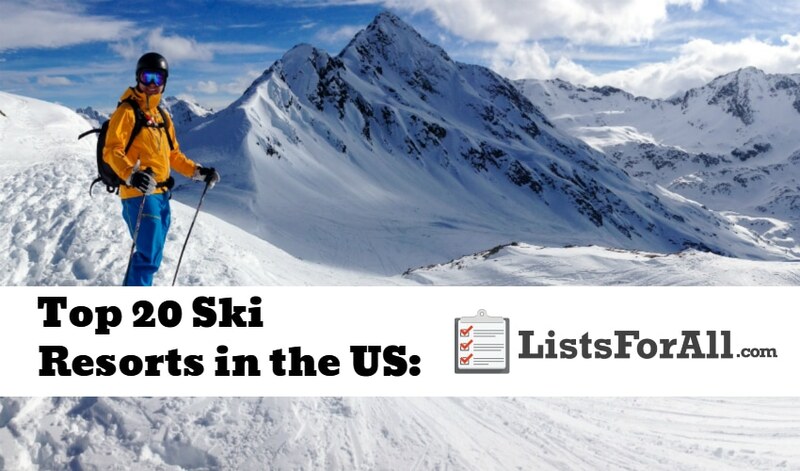 That’s why we have compiled a list of the 20 best ski resorts in the US. You will be able to check out some of the best ski spots all over the US and hopefully find your next ski trip destination. And, while this list favors western destinations, we have also included several eastern ski resorts that will please as well. So take a look through our list, and if you have skied and stayed at one of our picks let us know what you thought of it below! As the entryway to world-famous Yellowstone Park, Jackson Hole boasts every amenity imaginable. It also boasts a rugged and picturesque mountain scenery as well. The Jackson Hole Mountain Resort is going to be the preferred location for both skiers and snowboarders. Other popular nearby locations though include Snow King and Grand Targhee. All of these locations are going to provide for top-notch skiing and resorts. The town of Stowe is a quaint European inspired village. Outside of the town, you will get access to 116 trails as well as over 300 annual inches of natural snowfall. Additionally, the town boasts two top-notch hotels, as well as a number of condos and townhomes. Other amenities of the Stowe Mountain Resort include a ski school, spa, wellness center, and a children’s adventure center. With over 5200 acres of skiable terrain, Vail Mountain is one of largest ski resorts in the world. Quality is just as present as quantity though at Vail as the US Ski Team played host to the World Alpine Ski Championships there. The village of Vail also offers superb service and amenities as well. The impressive 100,000 square foot Arrabelle’s Rock Resorts Spa is just one example of this. Park City Mountain Resort is located in beautiful Park City, Utah. Visitors of Park City will get access to 7300 acres of skiable terrain and a variety of different ski trails. And, with a recent $50 million investment to the resort, this area has become one of the premier destinations for family skiing and snowboarding. Off of the slopes, a vibrant culinary scene highlights both the town of Park City as well as the resort. This will ensure that when you are done skiing, you have something delicious to eat. Breckenridge features the highest chairlift in North America and five dramatic peaks to choose from. This is going to provide some epic skiing opportunities for visitors. The historic town of Breckenridge also features colorful Victorian houses, a happening arts scene, and a vibrant food scene. For a true skiing experience, Breckenridge is the place to be. Steamboat Resort is in the heart of the American West and steeped in history. Visitors will receive an authentic mountain town experience with a touch of luxury. There is no shortage of scenery in Steamboat either as it features 165 trails and almost 800 surrounding area ranches. Also, with plenty of snow, this is the perfect resort for serious skiers. California’s highest four-season resort (over 11,000 feet above sea level) is about five hours north of Los Angeles and three hours south of Reno. With stunning views around every corner and great amenities at the resort, Mammoth Mountain Ski Resort is a no-brainer. Sun Valley Resort in beautiful Sun Valley, Idaho is a true destination ski resort. The resort offers more than 2,000 acres of varied terrain and 3,400 vertical feet. The two mountains in the valley will provide endless fun, while 13 chairlifts and a “Wundercarpet” make for no wait times. Adventure trails and a full-featured terrain park also add to the resort’s appeal, making this an excellent resort for the whole family. Killington Mountain Resort is situated in the largest ski area in the Eastern United States. Located near Killington, Vermont, it has the largest vertical drop in New England (just over 3,000 feet). Skiers of all abilities will have fun here, and the 22 lifts (including two express gondolas) help to cut down on wait time. A great place to ski (or snowboard), Big Bear Mountain Resort has an innovative park design. The design is going to provide a variety of world-class features that are spread out over 748 acres. Also, a state of the art snowmaking system ensures snow year-round for guests. And, a fleet of certified skiing instructors will ensure that skiers of all levels can improve their skills. Camelback Ski Resort is a family-friendly ski resort in the Pocono mountains of Pennsylvania. It is an excellent resort for first-time skiers or for families looking for activities in addition to skiing. With 166 skiable acres, 16 lifts, and 100 % snowmaking on all 166 acres of terrain, Camelback is a great choice. Located outside of Glacier National Park, Whitefish Mountain Resort is nicknamed “Big Mountain.” And, for a good reason as there are over 3,000 acres of skiing to choose from. Vast numbers of both bowl and tree skiing are available, as well as 105 marked trails. Add in the four terrain parks and skier/boardercross courses that are also available, and it is easy to see why so many people love Whitefish. Snowshoe Resort in West Virginia is an easy drive from DC and features 41 trails, seven lifts, and 100% snowmaking. Also, a variety of runs allow everyone from beginners to experts to have fun. The 257 acres of skiable terrain and 1500 vertical feet ensure that you always have something fun to do. So if you are in the North Eastern United States, you may want to consider visiting Snowshoe for your skiing fix. A no-frills classic Southwest resort, Taos Ski Valley puts skiing first. Powder shots, sharp chutes, cornices, glades, and gentle slopes all highlight the terrain. And, off of the slopes, you will be able to take advantage of the spas and wellness centers. So for all things ski related and relaxation related, Taos Ski Valley is going to do the trick. Lake Tahoe offers a number of gorgeous views and backdrops. Outside of the views, it also offers world-class resorts, slopes, lifts, and entertainment options to choose from. Now add in the 400 plus inches of snowfall each year in the Tahoe area, and you have something special. With all of this snow, Lake Tahoe’s different ski slopes like Heavenly, Squaw Valley, and Northstar become a skier’s paradise. Located just 50 minutes from Denver, Keystone Resort boasts one of the best-ranked terrain parks (A51) in the country. The park also boasts the longest ski day in the state, with slopes open from 8:30am-8pm. Other attractions include AAA 4 Diamond rated restaurants, as well a luxury spa and a 5-acre skating rink. Situated at 9500 feet, the scenic village of Telluride features some world-class resorts. You will be able to choose from resorts like The Peaks, Lumiere, and Hotel Madeline; all of these place emphasis on service and luxury. Outside of the resorts though there is world-class skiing available. The slopes offer some good variety as well. A little over half of the terrain is suitable for beginners or intermediate skiers. While the other half features popular trails like, “See Forever” for more experienced skiers. Whiteface Mountain offers the most significant vertical drop east of the Rockies. So if you are on the East Coast and looking for a quality ski destination, this may be the right fit for you. Whiteface is located just outside of Lake Placid, NY and offers skiing options for both beginners and experts. Of the mountain’s 86 trails, 20% are suitable for beginners, and 80% are going to be perfect for intermediate to expert skiers. Off of the slopes, the village of Lake Placid is worldclass in its own right. It was a two time Olympic Village location and boasts a number of winter events and activities. With great ski-in and ski-out lodging, and a family-friendly atmosphere, Snowmass has a lot going for it. Snowmass is not alone, however – there are also three other nearby ski resorts as well. And, with one lift ticket you will get access to both Snowmass and the neighboring resorts. Snowmass also has the longest vertical descent in the United States (4406 feet). Outside of being on the slopes, Snowmass is only a short drive from the nightlife and action of Vail as well. Located around 45 minutes from Salt Lake City, Alta boasts fantastic terrain and powder, as well as relatively cheap lift tickets. When you get hungry from all the skiing on the slopes, Alta also offers two ski-in ski-out restaurants. Take note, however, Alta is for skiers only – snowboarding is not permitted at Alta. Whether you are an expert skier or just starting out, you will be able to find a resort on this list that speaks to you. And, outside of skiing some of the best slopes in the US, you will be able to relax, eat, and enjoy all of the resort amenties. So what are you waiting for? Start planning your next ski vacation and get ready to enjoy everything that these resorts have to offer. When you do plan your trip, make sure to visit our list of the best travel sites. This list will help to make sure that you are saving money, time, and end up with an awesome stay. Have you been to one of these ski resorts already? We would love to hear your feedback in the comments below.